Most large theropods – in fact 20 of the largest 22 species like T. rex and Allosaurus – have bony bumps or crests on their heads. Paleontologists hypothesize that the accoutrements served as socio-sexual display mechanisms – a way for the dinosaurs to signal to one another for mating, territory or defense purposes. Terry Gates, lecturer in NC State’s Department of Biological Sciences and research adjunct at the North Carolina Museum of Natural Sciences, wondered if there was a correlation between the development of cranial ornamentation and rapid gains in size. 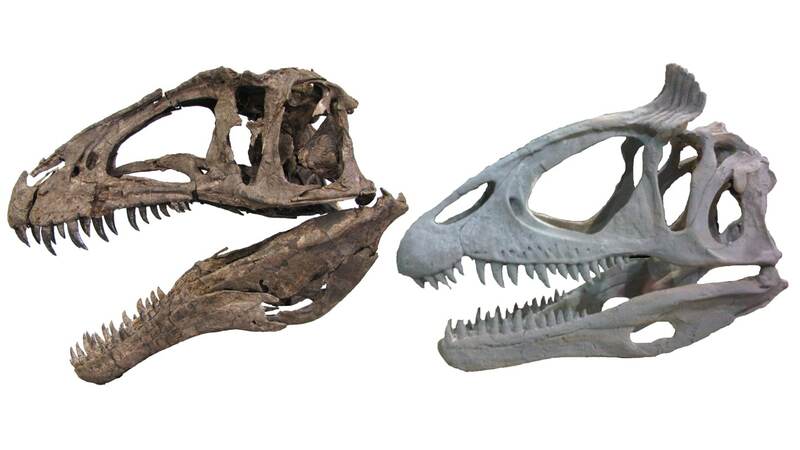 Along with colleague Lindsay Zanno, also of NC State and the NC Museum of Natural Sciences, and Montana State University’s Chris Organ, Gates examined the fossils of 111 ornamented and unornamented theropods and compared their size increases over time. Using observational data and computer modeling, the researchers found that for theropods weighing under 36 kg (about 80 pounds) bony cranial ornamentation did not evolve. Above that threshold, 20 of the 22 largest theropods had ornamentation. And it turns out that once a theropod species developed some style of head display, subsequent species would take large leaps toward gigantic body sizes every 4 to 6 million years. Large theropod lineages containing species without ornamentation – such as Acrocanthosaurus – did not achieve giantism as rapidly as their ornamented brethren. The researchers also looked at the lineage of dinosaurs that led to modern birds – including maniraptoriforms like Velociraptor, Ornithomimus and Falcarius. These dinosaurs never acquired bony head displays (except the parrot-like oviraptors) despite the fact that many of them weighed much more than the 36 kg threshold for gaining such ornamentation. This led the researchers to wonder why the closest relatives to birds were defying the pattern observed for other theropod dinosaurs. “The best explanation is that the long stiff feathers, which originated in this group of dinosaurs and were similar to modern bird feathers, could perform equally well as social signals when compared to the bony displays in T. rex or Dilophosaurus,” Gates surmises. Zanno agrees. “Our work supports the idea that vaned feathers were great communication tools from the get-go and may have helped large bird-like theropods sidestep the bother of skeletal bells and whistles,” she says. The research appears in Nature Communications. Gates was funded by the National Science Foundation. Exaggerated cranial structures such as crests and horns, hereafter referred to collectively as ornaments, are pervasive across animal species. These structures perform vital roles in visual communication and physical interactions within and between species. Yet the origin and influence of ornamentation on speciation and ecology across macroevolutionary time scales remains poorly understood for virtually all animals. Here, we explore correlative evolution of osseous cranial ornaments with large body size in theropod dinosaurs using a phylogenetic comparative framework. We find that body size evolved directionally toward phyletic giantism an order of magnitude faster in theropod species possessing ornaments compared with unadorned lineages. In addition, we find a body mass threshold below which bony cranial ornaments do not originate. Maniraptoriform dinosaurs generally lack osseous cranial ornaments despite repeatedly crossing this body size threshold. Our study provides novel, quantitative support for a shift in selective pressures on socio-sexual display mechanisms in theropods coincident with the evolution of pennaceous feathers.